Ben, Oli, Debbie, Me. The last 10 miles went on forever. Thank goodness for pizza! I don’t think we’ve looked this happy after a ride as we do here. My goal in February when I first started riding seriously was to complete a metric century. Now, I have on a ride organized by yours truly. 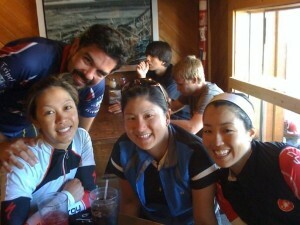 After dragging my friends to ride 80 miles with me (yes, dragging, and they made it very clear during the ride they were forced to do this ride), we had the best grub at Pizza Port in Solano Beach, CA. My favorite part, other than the pizza, was the ride through Camp Pendleton. The roads were void of cars for the most part and although there was a little headwind, it was a serene experience to be with just your bike, the road, and fellow cyclists. If anyone wants to try this ride, let me know! I’m always available for this ride! Now that I’ve done a metric century, I’ll have to do my organized metric century event, then the REAL century is next….